When the vows are spoken and rings exchanged, the only thing that will remind you of a Big Day is your photo album. Although having an album with printed photos is doubtlessly more romantic, you are probably dying to share the great news with the whole world, or at least with the whole web. 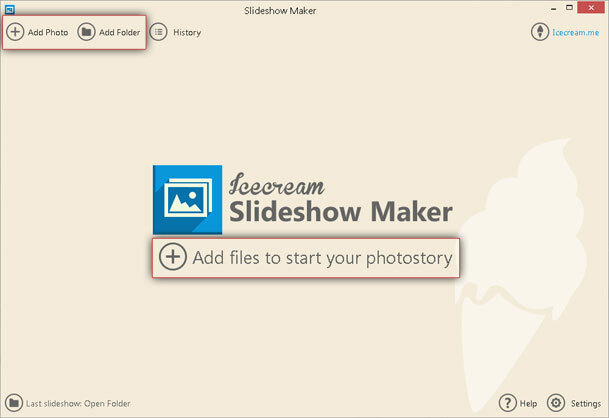 In this case, Icecream Slideshow Maker will be the tool to spread the word by helping you create a slideshow presentation with your wedding photos. Read on to learn how to make a wedding slideshow. The first thing you should do is download Icecream Media Converter from this site. The process is standard: click on the button, save a setup file, run it and complete the installation as suggested by the Wizard. It takes less than a minute, and after that you can skip straight to creating your wedding slideshow. There are 2 ways of adding files to the program. The first one suggests adding single files by clicking the ‘Add photo” or “Add file to start your photostory” buttons in the upper left corner and the center of the main window respectively. Click on one of them to select photos in JPG, JPEG, BMP, or TIFF formats. Most likely, you store all your wedding photos in a separate folder – in this case, you can import all these images in a single click by pressing the “Add folder” button in the upper left corner. After clicking on the button, you will be allowed to select file(s) from your computer via Windows Explorer. When the files are added, the main window is divided into two sections: file queue at the left and preview zone with settings at the right. You want to start with the left-side one. First and foremost, decide on the duration of the slides. It may depend on the amount of the photos in the project – the more you add the quicker they go. You can choose the values from 1 to 20 seconds in the “Time” section. After that, work with the effects. The program offers over 20 transition effects (Pixelate, Zoom, Wipe, etc. ), and also the “Random” and “None” options. Preview them by pressing “Play” on image’s thumbnail in the queue. You can delete certain files from the queue by clicking on a recycle bin icon in front of it. You can configure the “Time” and “Transition” settings separately for each file or go down to the grey panel and set the desired values for all your photos. Use the “Clear list” button helps you delete all the items from the list. You can move the items in the queue by selecting one of them and using the arrows at the side. Alternatively, just drag and drop it to a desired position in the queue. If you want to choose a default filename (“sshow_yymmdd_hhmmss”), you can do it right now by typing the desired name in the box. After that, go to the opposite side of the window and tweak the remaining settings (note that all the settings in the right-side panel are applied to the entire slideshow, not to the separate files). Find the “Resolutions” option under the preview zone and choose a necessary resolution from the dropdown menu. Then, configure the “Transition duration” setting in the same way. Check the “Scale to fit” box if you want all your images to fit the screen, or choose the “Original ratio” setting if you want to leave them unchanged. Wedding slideshow requires some romantic music on the background – this is the best way to reflect the mood and give your slideshow the right feeling. To add a song to the slideshow, click on the “Add audio” button on the settings panel. Browse your computer with Windows Explorer and choose the song that you’d like to use. After that, configure the “Offset” setting for the added file. By choosing a negative value you make the audio start playing immediately, shifted by a certain time, while a positive value will make the audio start playing after a specified time. Configure the “Fade” setting if you want the song to fade in or out. Before making a wedding slideshow, click on the “Preview” button to make sure the presentation looks good. Finally, hit the “Create” button in the bottom right corner to start the process. Use the controls at the bottom right to pause, resume or cancel the slideshow while it’s being created. A popup window will show up immediately after the project is finished. Press the “Open folder” button in this window to view the slideshow in a containing folder. Now, you are ready to share your masterpiece with the world – hit the YouTube button, and the video will be posted on your channel right away.